Play Sound is a simple, no-fuss sound player for classic Mac OS and Mac OS X. It supports QuickTime sound files (for example, AIFF or MP3 files), Mac OS System 7 sound files (files with a file type of 'sfil' that contain 'snd ' resources), or any 'snd ' resources embedded into any file. You can play an unlimited number sounds concurrently or one at a time. You can loop sounds indefinitely, repeat sounds a certain number of times, play specified portions of sounds, control the volume of sounds played, and press the Escape or Command-Period keys to abort sound play. Play Sound is fully scriptable, allowing AppleScript writers to use simple, easy-to-understand English syntax to play sounds. FindFilesX is a Mac OS X scriptable application that enables AppleScript developers to gather lists of files and folders starting at any location on any drive connected to a Macintosh, including items in subfolders, no matter how deep. You can use FindFilesX to search for files with a wide range of criteria, such as name, kind, date, label, just to name a few. FindFilesX is shareware, and is no longer being actively developed. 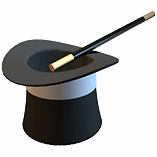 IRCmagic is a classic Mac OS AppleScript enhancement for a popular Macintosh IRC chat client, Ircle. Among IRCmagic's built-in features are many handy IRC-related features like automatic nickname completion, custom CTCP replies, powerful input line aliasing, and fully-configurable sound synchronization functions like automatic sending and receiving of played sound files. Also included is a full-featured Jukebox that plays your sounds unattended, sound player management functions, automatic Finder labeling for downloaded sound files, and many other useful features. All of IRCmagic's built-in features are fully configurable, and easy to use. IRCmagic also provides a fully featured plug-in script interface that allows anyone to add their own features. IRCmagic is shareware, and is no longer being actively developed. StopIt is a classic Mac OS application that runs quietly in the background while you're away, turning your Mac into a completely self-contained home alarm system. It monitors audio input devices, your mouse, your keyboard and floppy drives connected to your computer and sounds a customizable alarm if intrusion is detected. StopIt is no longer being actively developed. FindFile OSAX is a classic Mac OS scripting addition that allows you to gather lists of files and folders starting at any location on any drive connected to your Macintosh, including items in subfolders, no matter how deep. FindFile OSAX is extremely fast and easy to use. You can search for files with the same criteria used in the Mac OS Find File (or Sherlock) utility. FindFile also allows you to press the command-period key combination to halt a search and return you to your scripting. All of this power is available to you from within your AppleScripts, with the ease and simplicity of the english language. FindFile OSAX is shareware and is no longer being actively developed. System Language is a classic Mac OS extension to Applescript that allows a scripter to determine in his script what language is being used by the system on which the script is running. A numerical language code, or the name of the language in plain text is returned based on how System language is called by the scripter. One possible use of System Language might be to allow scripts to automatically detect and adjust to running on systems in different languages. System Language OSAX is freeware and is no longer being actively developed. REC is a simple classic Mac OS recording utility designed to be an alternative to the Sound control panel's record function. Since this is a small stand-alone application, it is much easier and faster to use than Apple's Sound control panel. Say goodbye to digging through folders (or menus) to open the Sound control panel or a big, slow sound editing program to record a simple sound. Just double-click the REC icon, and presto - you are recording. REC will save the sounds you record in System-7 sound format. REC is shareware and is no longer being actively developed. This is a classic Mac OS Applescript that adds extremely basic, but often requested, password protection to Microsoft Outlook Express and Microsoft Entourage. The script provides the same level of security found in Outlook Express version 4.x. The script prompts you for a password when your emailer is launched. It also allows you to change your password and set certain characteristics of the script via a built-in user interface. The script has full support for multiple identities. Ask For Password is freeware and is no longer being actively developed. Copyright © David Blache. All rights reserved. Any unauthorized reproduction is prohibited.